Native Instruments' new Traktor Kontrol D2 makes an appearance at the Winter Music Conference in Miami. Pictured here are two Trakor Kontrol D2's in UNER's set-up. Native Instruments’ new Traktor Kontrol D2 makes an appearance at the Winter Music Conference in Miami. Pictured here are two Trakor Kontrol D2s in Uner’s set-up. Native Instruments has just shown a glimpse of its upcoming Traktor Kontrol D2 controller over at the Winter Music Conference in Miami. 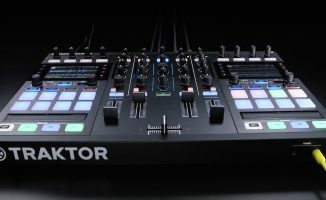 The Traktor Kontrol D2 looks like one side of the flagship Traktor Kontrol S8 without a mixer, and looks to appeal to folks who want the Remix Decks plus built-in screen plus touchstrip feature set without having to lug around a big controller. Native Instruments hasn’t set a release date and price at the time of this writing. Based on the photo posted by Uner on his Facebook page, his set-up consisted of two Traktor Kontrol D2s, an Allen & Heath Xone:92 mixer, and a Native Instruments external sound card for four-deck audio. It has four foldable rubber feet underneath the unit so you can elevate it to standard DJ hardware height. You can see it angled in the photo above and in the Uner video because only two feet have been propped. 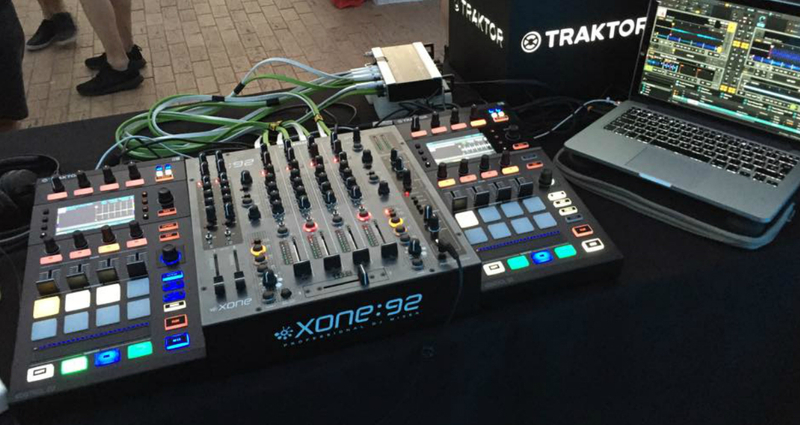 It’s also much larger than a Traktor Kontrol X1, judging by how it looks beside the Xone:92 mixer in the photo. 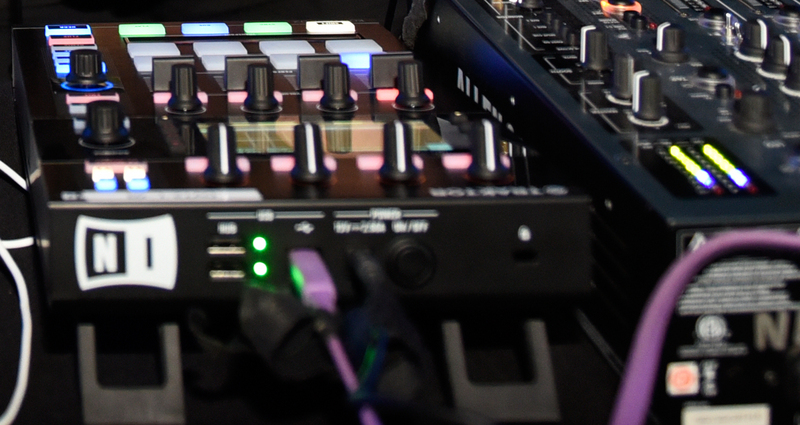 The Traktor Kontrol D2 will allow you to chain another unit to it so you don’t need an extra USB port on your laptop. You’ll need to connect the Traktor Kontrol D2 to a mains outlet (presumably because of the power draw of its onboard screen), and you can chain that too using the included power supply splitter cable. The Traktor Kontrol D2 comes with its own USB hub for daisy chaining other units. No sound card / audio connections present. The Traktor Kontrol D2 does not have a sound card onboard. From the photos sent to us by NI, the only connections in the back are a power supply jack, a USB socket, and what looks like a two-port USB hub for chaining other controllers. 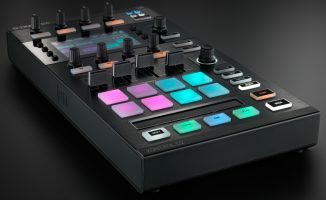 The Traktor Kontrol D2 looks very similar to what the right deck of the Traktor Kontrol S8 looks like, save for a few added buttons on the upper right of the Kontrol D2. It seems like you’ll be able to control more than one deck using it, although it’s unclear whether you can control all four decks in Traktor with just one Kontrol D2. The modular nature of the Traktor Kontrol D2 means you can theoretically have Traktor Kontrol S8 deck functionalities with any hardware mixer of your choice, or as a complement to your existing Traktor set-up, whether it’s a DVS or a controller. The Traktor Kontrol D2 gives you the built-in screen and deck controls featured on the Traktor Kontrol S8. Shown here is Uner controlling Traktor’s Remix Decks. 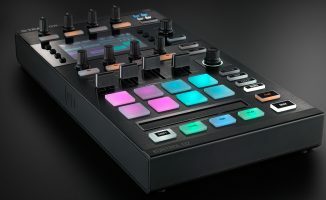 By releasing the Traktor Kontrol D2, which we’re assuming will cost a lot less than the Kontrol S8 (though probably more than a Kontrol X1), Native is bringing the “#FutureOfDJing” downstream. Where the Kontrol S8 may seem out of reach for a lot of digital jocks, especially for cash-strapped beginners, the Traktor Kontrol D2 is another weapon in the armoury of widespread adoption of its jogwheel-less vision. Removing jogs was a bold move by Native, but we wondered if the company might release a modular jogwheel controller soon after to appease “traditional” digital DJs. We had a dream set-up in mind that consisted of the forward-thinking innovations provided by the Traktor Kontrol S8 paired with the familiarity of some NI-branded jogs, with digital DJs living happily ever after in a hybrid kingdom of the “futuristic traditional”. However, changing people’s minds about DJing is something that Traktor has been an advocate of since its early days (eg sync, Remix Decks), so the company is true to form here on that, but also another point to make is that a small unit like this is a much better bet for squashing into a crowded DJ booth than, say, an S8. Check out the Traktor Kontrol D2 in action in the photo gallery below. Are you interested in a controller like this for your DJ set-up? How will this affect Traktor in the years to come? Share with us your thoughts on NI’s new controller in our comments section below. Big mistake. They have lost all momentum to release a X1 with a screen. The D2 is not portable enough and N.I. starts to irritate me and others with ther obsession for remix/sample decks. This takes a huge amount of space on the controllers and most of us don’t use them. There is only a small market of DJ’s that really uses that. Please back focus on software, portability and 4decks. It may not look like much at Traktor’s current release, so I’m very interested in what NI have up their sleeves for the next big version of Traktor. Right now, Remix Decks may be an “add-on” feature, but with all the Remix Deck-focused gear and slant on live producing that Native is churning, we may see Remix Decks play a central role in Traktor’s future. I just hope you can use one of these to control 2 decks, like you can with an X1 so I could just take one of these and dj as I only use 2 decks anyway. With the clubs existing mixer. I would rather use the screen on here than my laptop. I wonder also if this will have anything to do with the traktor dj app????? Regarding the Traktor DJ app, no word yet. That would be very cool though! I really tried to find those RCA outputs of the D2, but couldn’t spot them in the video. Could you please tell me, how and where you managed to spot them? Hey Walter! Made a mistake, those weren’t RCA leads. They were just power cables and USB, I thought they had been RCA jacks! Updated the article just now, we’ve got some new photos from NI and they show that there isn’t an onboard sound card here. My initial thought was “take my money”. But then the sensible part of me kicked in. I’m still very satisfied with my s4 and f1s. My backup is a z1 and an X1. Maybe if I played at clubs more I would be more than mildly tempted by this, since it would allow me to use 1 device instead of 2. Be ideal to go with that! Based upon what we see and are being shown I see Native Instruments telling us consumers to leave the jog wheels to Pioneer. I think they probably saw that they really could not compete with the CDJ and XDJ and so decided to support more of their products with HID compliance to use along side their S8 and eventually D2 controllers. Pioneer and Traktor will continue to coexist in the DJ booth. 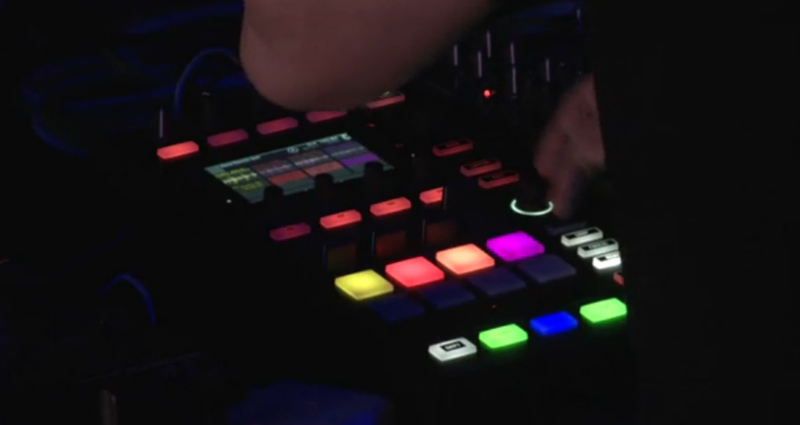 Controllers look quite fascinating and definitely integrate more of the Traktor friendly features I enjoy using. On a side note, one thing that particularly caught my attention was the clipping and overall abundance of red! The Xone 92 was glaring in the +10db’s which made me cringe… Knowing that Veteran DJ’s are behind the decks could someone explain this observation or am I just seeing things? Cool! Every brand sets the leap into massive development, which is great. There’s a lot possibilities and technics in djing. I saw many people in lot forums gave negative responses to this one. Well, if you think it’s not for you, just leave and dont buy it. Simple as that. I’m happy with my current equipment and not planning to spend my cash on another tools right now, but it seems so interesting to see technology moving on.